Whether juicy apples or sweet plums: during fruit harvest, it is important to treat fruit as gently as possible. A case for our professional fruit picking bag! 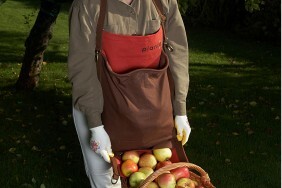 The highlight of this harvest bag lies in the design: two intelligent snap hooks allow to open the bag at the bottom. This way the harvested fruit can easily roll into your crates and baskets! 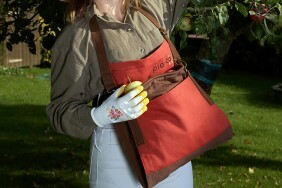 The exceptional harvest bag leaves both hands free for picking - very handy when you're standing on a ladder! The attractive bag in protected planto design is made ​​of heavy two-tone cotton canvas. Thanks to the padded and individually adjustable neck strap it is very comfortable to wear.